The Retrofit 2012 academic conference took place in Salford last week. Organised by Salford University, the conference brought together a wide range of researchers from a range of disciplines. Its purpose was to consider and debate how we can tackle the dramatic reduction in demand from the existing building stock required to meet the 2050 target of a reduction in CO2 emissions by 80% (over 1990 levels). Phlorum’s Jackie Strube was there presenting a paper on solid wall insulation and its significance in achieving retrofit targets and was delighted to meet so many people with a shared interest. Highlights of the conference were the presentation by Brenda Boardman of Oxford Brookes on her new report, ‘Achieving Zero’, available to download here. There was also a useful reminder that updated domestic energy statistics are available from DECC in a new format, together with a range or interactive tools: Available to download here. 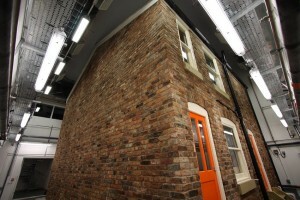 Salford University are carrying out extensive research into retrofit methods and last year launched Joule Terrace (here), a house constructed to Victorian standards in a climate controlled environmental chamber which is being used for a range of research projects.